Google dominates the market when it comes to business listings-with Google processing about 3.5 billion searches every single day. It’s easy to understand how local searches would a huge part of that 3.5 billion- after all, Google has become the perfect replacement of a telephone book, and is the destination most people go (even if by default) to find any localized information they want. Want a restaurant for your dinner date on Friday? Google. Looking for a dry cleaner near you? Google. Want to know the nearest theatre with disability access? Google! As a user, we have officially reached a point where a large proportion of our knowledge and information comes through the search page and through Maps: but let’s take a moment and think about the other side. As a business, what is it that I’m supposed to do to make sure that people see my business when they do their searches? You may have a website, but people might want to review the basic information of your business before deciding whether they want to visit your website or not. The answer? Google My Business! Even if you have not heard of the actual name, you’ve definitely seen it before, on one of your searches (and on Google Maps as well). On the user side, Google My Business gives users the basic information about your local business, without needing them to browse through too many websites. On the business owner side of things, having these business listings can drive up business, and give you insights about how people are engaging with your local business. Why do you need a Google Business Listing? Before you create your Google Business account (or revamp it), let’s ask ourselves the most important question: why should you do this? First of all, as we already know, Google processes over 3 billion searches in a single day – that’s a lot of footfall! Secondly, most people do not make it to the second page of Google: the number of people going to the second page drops by an average of 71.82%! Now, it’s obvious the 71% is leaving because they have already found what they want on the first page- and that’s exactly where your business should be. Of course, there are a lot of other strategies you’d have to keep in place to ensure you’re on the first page of Google results but having a Google Business page will definitely have an impact on your strategy. According to Moz’s research on local search ranking factors, signals from My Business is the most significant factor in determining your ranking. Now that we know why you need a Google business listing in place, let’s discuss what is it that you need to do in order to get your Google listing in order. How do I optimize my Google My Business Listing? Before you optimize, you’ll have to set up your own page. You can do this by going to the Google My Business site, and by clicking on the start now button on the left. If there is already a listing of your business, all you have to do is claim the listing. This is a simple process that will determine your identity, and let you claim your profile officially. You can watch a simple tutorial on how to both here. You’ll notice there is a large variety of questions being asked when you have to fill out your Google My Business listing, including name, address, website, description, category, attributes, etc. This is basic information that will be useful for your customers, so make sure you fill in all these fields. It’s always valuable to add as much information as you can in these fields. The more detailed you are, the more legitimate you’ll appear (to Google and your customers). Another way of ensuring your legitimacy is to make sure that the information you’re entering is uniform everywhere: your website, your Facebook and on My Business. Take some time to make sure that the information you’re entering is correct, and as per your industry standards, because it definitely matters: inconsistent information across different platforms can have a negative impact on your search engine ranking, and that’s the last thing you want! Another step is to choose a specific category that explains the exact nature of business (you can go through the 2000+ categories available on GMB to understand which one suits your business the best). For example, ‘organic grocery store’ is a more niche category than ‘grocery store’ and the former is the better choice. You specialize in grocery deliveries? That’s the category you should choose. Reviews have become the lifeline of almost all businesses- 85% of consumers trust online reviews as much as they trust personal recommendations. Google insists on customer reviews, and displays it in the Knowledge Panel. Having reviews about your local business would definitely make your page stand out from the competition. Google encourages businesses to ask customers for reviews: the only criteria is that you have to do it ethically. You can do this by reaching out to them through social media, or through emails, and encouraging the customers to share their review on Google. Just follow the guidelines set by Google and you’ll be good to go. Expert Tip: Make sure you respond to the reviews you get on the platform, for it will increase your user engagement. This includes negative reviews, as 44.6% claim they would be more likely to visit a site if the business has responded to negative reviews. Google Posts are an interesting addition to My Business tool- it acts like a mini ad or a mini blog that shows up in your GMB listing. You can use this space to reach out to the consumers you want to engage with, and promote your brand. You can add a Post to your My Business listing by going to the dashboard, and going to the ‘Posts’ tab to add a new post. What can your posts be about? Anything relating to your business: a new blog post, or a sale, or an event you’re hosting. People are highly visual learners, and nowhere is it more obvious than on the internet. In fact, a study by Synup has found that listings that have photos get 35% more clicks, and are twice as likely to be considered reputed. Google My Business gives multiple opportunities for you to post photos and videos of your business, so make sure you use each opportunity. Expert Tip: Use a photo that showcases what your business does, so as to attract the right kind of customers. You can also use this as a way of engaging with your customers- you can ask them to add photos of your business too! GMB has provided for a variety of user engagement features- the most important of which are Questions & Answers and Messaging. 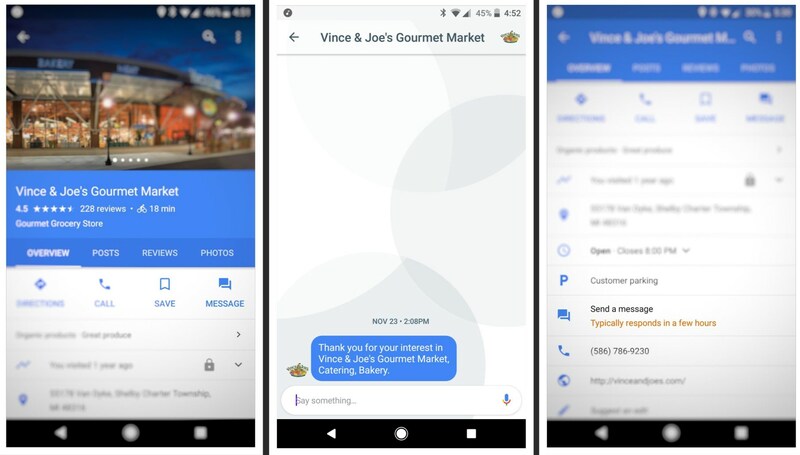 Messaging allows customers to contact and receive responses from your business directly through Google. If you don’t want to use your personal number, you can also use Google’s Allo app. Q&A is an integral part of local business postings, where Google asks people questions about your business, and they can answer it. You have to note that it won’t be included in your GMB dashboard- rather, it will be in your Google Maps account. You should remember that Q&A is a feature that’s open to the public: so do regular checks of this to ensure this feature is being used to the best benefit of your business! To understand what facets of GMB work for you, and which do not, you should measure your impact through Google My Business Insights, using which you can understand where customers are visiting you from, what information they’re looking for, what conversion path they are using and more. Google My Business is a valuable way of engaging with your customers and increasing your organic search rankings, so it’s clear why you should definitely focus on optimizing your business listing. Play around with the features, and measure your impact to find out what arenas your focus should be on! Write to us for free thirty-minute consultation for your website at contact@contentninja.in.